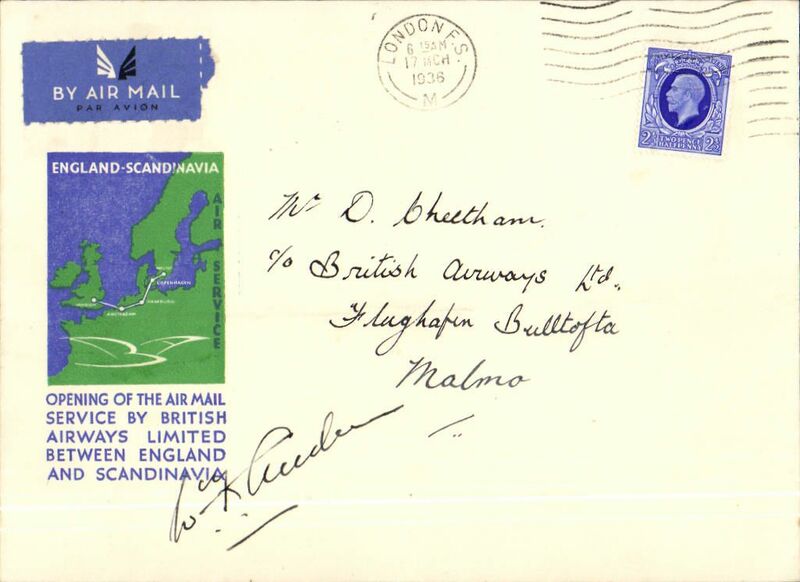 Description: British Airways, New England -Scandinavia service, London to Malmo, b/s 17/3, blue/green/cream souvenir cover franked 2 1/2d canc London cds, signed by the pilot Flt. Lt. W. F. Anderson. Ironed horizontal fold, does not detract, see scan. 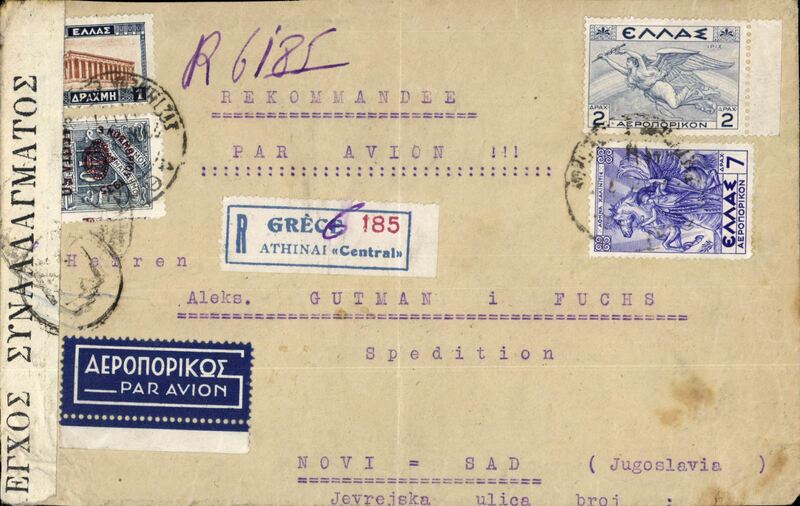 Description: Greece to Yugoslavia, censored and registered (label) airmail etiquette cover, Athens to , bs Belgrade Airport, and Jevrejska 25/11, sealed Greek B&W currency control strip tied by black circular censor mark, dark blue/white airmail etiquettes front and verso. Ironed vertical crease. 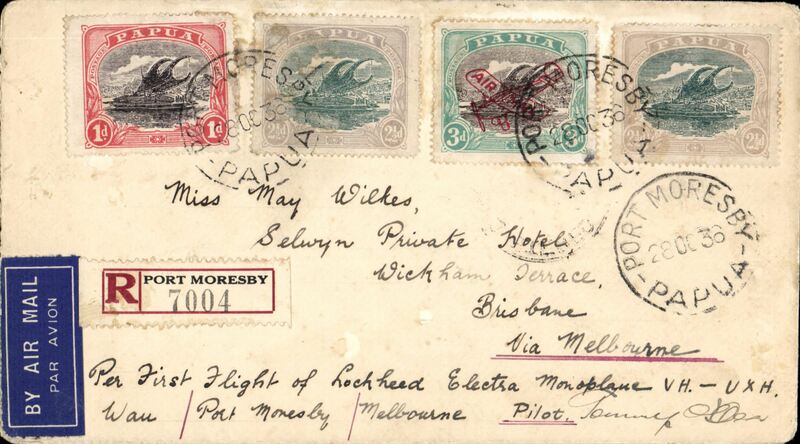 Description: Guinea Airways Lockheed Electra flight, Port Moresby to Melbourne bs 30/10, registered (label) cover franked 1916 1d, 2 1/2d x2 and 1930 3d air. Signed by the pilot Tommy O'Dea. Nice item. Description: NIGERIA TO SCOTLAND, MAIDUGURI TO KIRKWALL, Delayed F/F, Elders Colonial AW/Imperial AW West Africa Feeder Service to Khartoum WAN2 by Daedalus (the first northbound feeder service to carry mail, see Wingent p179,80) then transferred to IAW South Africa - GB service AS319 carried to Cairo/Athens one day late by Hannibal, to London 25/2 by Scipio, and on by air to Kirkwall 26/2. Plain etiquette cover, franked 6d canc Maiduguri cds, "First Flight/Airmail" hs. Only small mail from Maiduguri, see West African Airmails, The McCaig and Porter Collections, Priddy, B., West Africa Study Circle, 2012. Few hinge marks on flap, see image. 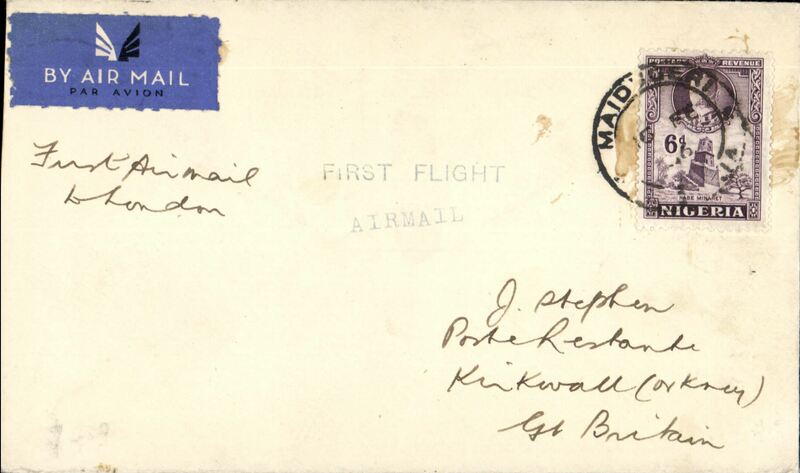 Description: Possible Pan Am/KLM 'test' flight, endorsed "Round the World Via US and Dutch Air Lines", San Francisco - Manila 1/3 - Batavia 11/3 - Newark, NJ 28/3, airmail cover addressed to KNILM Airways Batavia, franked 75c US stamps canc San Francisco Feb 9, 1936, then re-addressed to Newark, NJ and refranked Netherlands Indies 45c canc Batavia 12/3 cds, tying Dutch AV5 'Per Luchtpost/Par Avion' airmail etiquette. 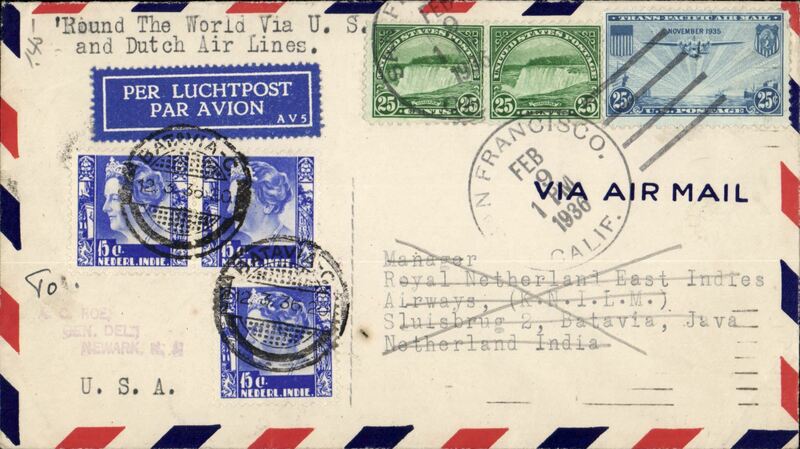 The first regular airmail flight from San Francisco to Manila was 10 weeks earlier on Nov 22, 1935. Interesting.